Tough life. Life is tough. One moment it’s easy, but you’ve forgotten to balance. Balance your friends with your cheque book, balance your studies with your beau. Balance everything. So you wake up one day with an emerging epiphany, or is that just another grey hair? You think, I need to be better. I need to be more than I was yesterday. I need to prove to myself, to the world, that I know how to have an easy life. I possess the organization, the skills to balance. To be whole. And you try for the next 24 hours to be on top of things. You say hello and goodbye. You eat quick, and think much faster. You make your bed, you wash your clothes, you say goodnight. You saw very little. Your friend was in need of comfort, but you had no time. Your food was not savored, your bed was unwelcoming. Your dreams lacked spontaneity, no escape from your perfect world. You balanced everything, and lost more. You walk around proud of your achievements. Of your ability to do what makes you thrive. But you feel alone, you crave attention, you try to be perfect but perfection isn’t perfect. 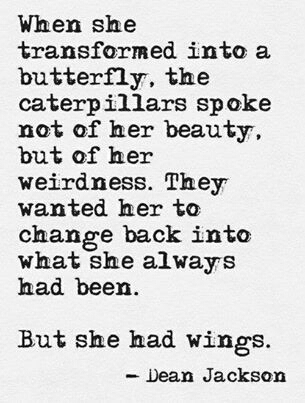 You have these wings that emerge when you do something for yourself, something that changes you. You fly to the comfort of the collective, as they fly to you. To follow the standard approach, to organize your chaos, to streamline your mistakes to reach avoidance. You are hiding those wings that take you to new places. I wanted to be normal. You wanted to be normal. But normal isn’t perfect. Normal lacks creativity, the term is stagnant. Live in constant flux, never pausing, always seeking new lessons, new experiences. You will find a passion for something that you hadn’t thought twice about before, before you hopped under your covers. You love like you live, in a stable manor. But those who love most, feel most, see hearts collide, beating. Be jealous of the free birds, not the nested ones.